Melrose Abbey was founded in 1136 by King David of Scotland, five miles from the ancient monastery where St Cuthbert lived as a young monk in the 7th century. The 12th-century Melrose was run by the Cistercian monks, an important order of the later middle ages who were influential in England and became more so in the following years. This manuscript, the only surviving ancient copy of the Chronicle, begins with the year 735. Its first section, up to the mid-12th century, was compiled from earlier histories, but from that point it seems to have been written at the monastery and records contemporary events. This makes it an important source of information for the later 12th through 1270, when it terminates suddenly. These entries for the 1170s have blank spaces between them, indicating that the years were written before the previous entries had been completed. The monks could have expected word of events months after they actually happened. 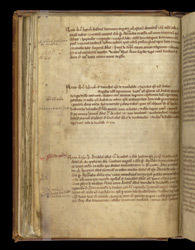 Most of the entries or notes in the margins which are written in red record the deaths of Cistercian abbots, usually of Rievaulx or Melrose. In the entry for 1170, the death of Arnald, abbot of Melrose, is recorded.